The production of biohydrogen (H2) as a promising future fuel in anaerobic hyperthermophiles has attracted great attention because H2 formation is more thermodynamically feasible at elevated temperatures and fewer undesired side products are produced. However, these microbes require anoxic culture conditions for growth and H2 production, thereby necessitating costly and time-consuming physical or chemical methods to remove molecular oxygen (O2). Therefore, the development of an O2-tolerant strain would be useful for industrial applications. In this study, we found that the overexpression of frhAGB-encoding hydrogenase genes in Thermococcus onnurineus NA1, an obligate anaerobic archaeon and robust H2 producer, enhanced O2 tolerance. When the recombinant FO strain was exposed to levels of O2 up to 20% in the headspace of a sealed bottle, it showed significant growth. Whole transcriptome analysis of the FO strain revealed that several genes involved in the stress response such as chaperonin β subunit, universal stress protein, peroxiredoxin, and alkyl hydroperoxide reductase subunit C, were significantly up-regulated. The O2 tolerance of the FO strain enabled it to grow on formate and produce H2 under oxic conditions, where prior O2-removing steps were omitted, such as the addition of reducing agent Na2S, autoclaving, and inert gas purging. Via the overexpression of frhAGB genes, the obligate anaerobic archaeon T. onnurineus NA1 gained the ability to overcome the inhibitory effect of O2. This O2-tolerant property of the strain may provide another advantage to this hyperthermophilic archaeon as a platform for biofuel H2 production. Anaerobic microbes play important roles in a variety of biotechnological processes such as fermented food production, biochemical synthesis, biofuel production, and bioremediation. For the cultivation and manipulation of these microbes, however, specialized methods are required to maintain anoxic culture conditions. O2 is potentially toxic to anaerobes; however, anaerobes also have mechanisms to cope with toxic oxygen species such as superoxide anions (O2−), hydrogen peroxide (H2O2), and free hydroxyl radicals (OH•) [1, 2]. To create an O2-free environment and the low redox potential that is essential for anaerobic growth, numerous methods have been employed . For instance, deaeration of nutrient medium by boiling is the simplest way to drive absorbed O2 out of a culture medium by reducing the solubility of gases at the temperature of boiling water. The combination of evacuation and purging of vials with O2-free gas facilitates the reduction of O2 tension. Chemical reducing agents containing sulfur, such as cysteine hydrochloride (E0′ = − 210 mV, redox potential defined at pH 7 and 298 K), sodium thioglycollate (E0′ = − 140 mV), or Na2S (E0′ = − 571 mV), are very effective at maintaining the low redox potential of the medium [4, 5]. Even though various physical or chemical methods are effective at keeping the culture medium anaerobic, these strategies are costly and time consuming. Hyperthermophiles have advantages in biotechnological applications because of reduced burden on reactor cooling processes, low chance of contamination, and increased reaction rates . Biohydrogen (H2) production using hyperthermophiles is furthermore advantageous because, at elevated temperatures, H2 formation is more thermodynamically feasible and fewer undesired side products are produced [7, 8]. Thermococcus onnurineus NA1 is a hyperthermophilic obligate anaerobic archaeon that is capable of producing H2 using starch, formate, or carbon monoxide (CO). It has been recently reported that T. onnurineus NA1 possesses high H2 production rates during growth on formate, comparable to those of various bacteria and archaea with a formate dehydrogenase and a hydrogenase in the form of formate hydrogen lyase (FHL) or hydrogen-dependent CO2 reductase (HDCR), or separately [9–17]. In particular, H2 production by T. onnurineus NA1 using steel-mill waste gas was successfully demonstrated, indicating that environmentally friendly H2 production is feasible [18, 19]. Over the years, H2 production by this strain has been improved by employing various strategies of genetic engineering [18, 20, 21], adaptive laboratory evolution [22, 23], and fermentation process engineering . Even though the strain has great potential for practical applications as an H2 producer, it must be carefully handled and cultivated to prevent exposure to O2 in all the steps. In addition to inhibition of cell growth, H2 production is also inhibited by O2 since membrane-bound [NiFe] hydrogenases, involved in H2 evolution, are O2 sensitive to some degree [25, 26]. In this study, we present a recombinant strain of T. onnurineus NA1 that can grow and produce H2 under oxic conditions, where any physical or chemical methods were not applied to remove O2 from the medium and the bioreactor headspace, which is a condition under which the wild-type strain cannot grow at all. The FO strain exhibited a very similar cell yield and only a 10% reduction in the H2 production rate compared to the strain grown under anoxic conditions. This study may enhance the prospects of exploiting this obligate anaerobe as a robust tool for biotechnology. In our previous report, the frhAGB-encoding hydrogenase from T. onnurineus NA1, homologous to the F420-reducing hydrogenases, a key enzyme in methanogenesis, was characterized . To obtain a higher yield of the enzyme complex for biochemical studies, the frhABG operon was overexpressed in the native strain using a strong constitutive promoter, resulting in the FO strain (Additional file 1: Fig. S1) . The production of frhAGB in the FO strain was measured by Western blot, and the Frh α subunit encoded by the frhA gene was observed to be markedly increased (Fig. 1). The FO strain grew well using formate as an energy source and showed 3.4- and 1.4-fold higher cell densities at 6 and 12 h of culture, respectively, than those of the wild-type strain (Fig. 2a). The fdh2–mfh2–mnh2 gene cluster was previously determined to be essential for the oxidation of formate and subsequent production of H2 coupled with ATP synthesis ; therefore, the concentration of H2 produced as a product of formate oxidation was measured. The FO strain produced 2.8- and 1.4-fold higher amounts of H2 at the two measured time points than those of the wild-type strain, respectively, which correspond to the increasing levels of cell density (Fig. 2b). These results indicated that the expression level of membrane-bound formate-dependent hydrogenase (Mfh2) was not changed, and the protein level of a large subunit of Mfh2 hydrogenase was confirmed to be similar to that of the wild-type strain (Additional file 1: Fig. S2). To explore the physiological changes that occurred through the overexpression of frhAGB genes, the expression changes were investigated at the whole transcriptome level. We performed microarray-based transcriptome analysis using samples of the wild-type and FO strains that were cultured in formate-supplemented medium under the anoxic condition. The results showed that 24 and 33 genes were identified as being up- and down-regulated with fold changes of ≥ 2 or ≤ 0.5 in expression compared with the wild-type strain, respectively (Additional file 1: Tables S1, S2). Among the down-regulated group, a gene cluster was identified to be related to the biosynthesis of disaccharides, oligosaccharides and polysaccharides (locus tag TON_1857 ~ 1862), including galactosyltransferases and glycosyltransferases. Some of the genes encoding proteins such as sulfate adenylyltransferase (TON_1707), transcriptional regulatory protein (TON_0836 and TON_1663), and ATP-dependent helicase (TON_1042 and TON_1380) were down-regulated. Among the up-regulated group, three gene clusters were identified, whose functions are predicted as transport (TON_0014 ~ 0015 and TON_0656 ~ 0657) and thiamine biosynthesis (TON_0853 ~ 0854). Two genes related to the stress response, chaperonin β subunit (TON_1877) and universal stress protein (TON_1493), were also up-regulated. Interestingly, two genes encoding peroxiredoxin (TON_0786) and alkyl hydroperoxide reductase subunit c (TON_0847), which are known to protect cells against oxidative stress by reducing hydrogen peroxide and/or alkyl hydroperoxides, were up-regulated. Based on the transcriptomic data, we speculated that the changes at the transcriptional level of several stress response genes caused by frhAGB overexpression might affect O2 tolerance of the strain. Therefore, we compared O2 sensitivity between the wild-type and FO strains. Each strain was cultured in sealed vials containing 0, 10, 20, 30, and 40% of atmospheric air (21% O2, v/v) in the headspace. With increasing percentages of atmospheric air, the wild-type strain showed gradual decreases in cell density, ranging from 17.9 to 56.7% of the control (0% air) (Fig. 3a). On the other hand, the growth of the FO strain remained constant, with changes in cell density ranging from only 7.7 to 11.9%, indicating a significant enhancement in O2 tolerance. In our previous report, the frhA-deletion mutant, ΔfrhA, showed very limited changes in cell density and H2 production compared with the wild-type strain . To correlate the intracellular level of the frhAGB-encoding hydrogenase with O2 tolerance, we tested how the O2 sensitivities of the wild-type strain, the frhA-deletion mutant strain, and the FO strain were affected at higher concentrations of O2 in the headspace of culture vials. Instead of air, pure O2 was added to a concentration of 20%, equivalent to the atmospheric concentration of O2. Once again, the FO strain grew much better than the wild-type strain (Fig. 3b). On the other hand, the ΔfrhA mutant strain was more sensitive to O2 than the wild-type strain. Since the FO strain showed strong performance in the presence of O2, we tested whether enhanced O2 tolerance could enable the FO strain to grow under oxic conditions. Therefore, several pretreatment methods that are typically applied to remove O2 from a culture vessel were omitted, namely the addition of reducing agent Na2S, autoclaving, and inert gas purging. In the bioreactor, the growth of the wild-type strain was severely impaired under oxic conditions, as expected (Fig. 4a). In contrast, after a prolonged lag phase, the FO strain started to grow and reached a cell density similar to that obtained under anoxic conditions (Fig. 4a). Maximum specific growth rates were quite similar in the two conditions (Table 1). This result is quite surprising, considering that the experimental strain used in this study, T. onnurineus NA1, is an obligate anaerobe. To our knowledge, it has never been reported that the overexpression of only one gene caused an obligate anaerobe to grow under oxic conditions. Then we sought to examine what would happen to H2 production under oxic conditions. Although H2 production was closely correlated with growth on formate under anoxic conditions , the maximum H2 production rate and maximum specific H2 production rate were approximately 90% of those under anoxic conditions (Fig. 4b and Table 1). In comparison with the wild-type strain cultured under anoxic conditions, the FO strain under oxic conditions showed 1.6- to 3.2-fold higher maximum specific growth rate, maximum H2 production rate, and maximum specific H2 production rate (Table 1). Taken together, the overexpression of frhAGB genes endowed T. onnurineus NA1 with a substantial increase in tolerance to O2. This O2-tolerant property is a significant advantage in biotechnological applications because it is not necessary to strictly protect the growth and H2 production processes from O2. H2 production under micro-aerobic conditions would be a cost-effective and time-saving process. When the frhAGB gene cluster was overexpressed in T. onnurineus NA1, a recombinant strain (FO) showed better growth than the wild-type strain. The molecular mechanism underlying the enhanced cell growth is not yet understood. Instead, we attempted to exploit the potential of the FO strain using information from whole transcriptomic analysis. The expression of antioxidant-related genes encoding peroxiredoxin and alkyl hydroperoxide reductase subunit c was 2.5- and 4.1-fold up-regulated under the anaerobic conditions, respectively. The transcriptional up-regulation of antioxidant-related genes is usually associated with cellular responses to oxidative stress. However, the sources for oxidative stress are unidentified. Extracellular O2 is usually removed by the addition of a reducing agent, autoclaving the medium, and inert gas purging. The absence of O2 in our experiment was evidenced by minimal or no change in the transcriptional expression of other antioxidant-related genes, such as thioredoxin peroxidase (TON_0862), rubrerythrin (TON_0864), rubrerythrin-related protein (TON_0873), NAD(P)H rubredoxin oxidoreductase (TON_0865), and thioredoxin reductase (TON_1603), which were identified to be strongly up-regulated in the presence of O2 (manuscript forthcoming). We speculated that the FO strain, with two antioxidant-related genes up-regulated, might exhibit changes in O2 tolerance. To verify this hypothesis, the O2 sensitivities of the FO strain, wild-type strain, and ΔfrhA mutant were compared. The expression level of the frhAGB gene cluster had a strong influence on oxidative stress defense. In the ΔfrhA mutant, however, the transcript levels of genes encoding peroxiredoxin and alkyl hydroperoxide reductase subunit c were similar to those in the wild-type strain . This result implies that there are more genes that contribute to oxidative stress defense in the FO strain. O2 tolerance in obligate anaerobes by means of hydrogenases has been reported previously. In obligate anaerobic bacteria Desulfovibrio vulgaris strains, H2-consuming periplasmic soluble hydrogenase and c-type cytochrome couples were identified to play a role in O2 reduction, thereby protecting against oxidative stress [29, 30]. It has been reported that the hydrogenase was up-regulated when D. vulgaris Hildenborough was exposed to O2 . In another obligate anaerobic bacteria Geobacter sulfurreducens, a periplasmic hydrogenase Hya was identified to be necessary for growth after exposure to oxidative stress. While the Hya-deficient strain was more sensitive to the presence of superoxide or hydrogen peroxide, overexpression of Hya enabled the strain to endure oxidative stress better than the wild-type strain. However, the mechanism by which this hydrogenase contributed to the defense against oxidative stress relative to the promotion of antioxidant enzyme activity was not elucidated . In this study, the FO strain was distinct in that it was able to achieve similar growth yields under oxic conditions, where most anaerobes and the wild-type T. onnurinues NA1 strain are incapable of growth due to the high O2 level, compared with those of anoxic conditions. In addition, the maximum H2 production rates and maximum specific H2 production rates of the FO strain cultured under both oxic and anoxic conditions were quite similar to the high values for the WTF-156T strain, which had been engineered by adaptive evolution on formate-supplemented medium . This feature can ameliorate the need to tightly maintain the anaerobic environment prior to cultivation in a batchwise or continuous system, where a certain level of O2 contamination is inevitable, by operating with the addition of carbon sources or other nutrients, or by maintaining a constant pH using strong acid or bases. Therefore, the ability of the FO strain to tolerate O2 would make it even more suitable for industrial applications. Our study implicates that other anaerobic H2 producers might be relieved from the strict control of O2 during growth through augmentation of the defense against oxidative stress. It would be helpful if we could get high amounts of whole cell biocatalysts and even purified enzymes from them easily by growing those strains under oxic conditions while the activity of enzymes, such as hydrogenases, FHLs, and HDCRs, essential for H2 production [12, 14, 16, 17], is untouched. This study helps to understand the physiological role of the frhAGB-encoding hydrogenase, which is distinct from Frh hydrogenases of methanogens and is thus far poorly understood. In our previous report on the frhA-deletion mutant, it was shown that the hydrogenase might be associated with the regulation of gene expression in a non-methanogen . For example, frhA gene deletion caused up-regulation of the codh–mch–mnh3 gene cluster essential for CO-dependent H2 production even in the absence of external CO and led to significant increases in cell growth (2.8-fold) and H2 production (3.4-fold) . In this study, overexpression of frhAGB genes also up-regulated the expression of antioxidant-related genes without exposing them to an oxidizing agent such as O2. Furthermore, the FO strain was superior to the wild-type strain with respect to growth under oxic conditions. Regulatory hydrogenases HupUV and HoxBC have been reported to participate in the transcriptional regulation of gene expression . These hydrogenases function as H2 sensors in two-component regulatory systems, which consist of a protein histidine kinase and a response regulator . Two-component regulatory systems are distributed widely in bacteria, but only a few are found in archaea . Therefore, if the soluble hydrogenase is playing a regulatory role, its mechanism in T. onnurineus NA1 awaits further studies. It is noteworthy that two genes encoding transcriptional regulatory proteins (TON_0836 and TON_1663) were down-regulated by overexpression of frhAGB genes. Further studies will be required to address whether these regulators are involved in the regulation of gene expression by the frhAGB-encoding hydrogenase. Contributions of other up- or down-regulated genes by overexpression of frhAGB genes cannot be ruled out; therefore, this issue requires further investigation. In this study, we demonstrated that the overexpression of frhAGB-encoding hydrogenase genes significantly enhanced O2 tolerance of obligate anaerobe T. onnurineus NA1. This engineered strain overcame the inhibitory effects of O2 and showed growth and H2 production under oxic condition. This study gives an insight into the development of biotechnologically useful anaerobic H2 producer and identification of an unknown function of the hydrogenase in T. onnurineus NA1. The T. onnurineus NA1 wild-type (KCTC 10859), FO strain overexpressing frhAGB , and frhA-deletion mutant  strains were cultured at 80 °C in modified medium 1 (MM1) with 1% sodium formate (MM1-F) as previously described [10, 34]. In serum vial cultivation, the initial pH of the medium was adjusted to 6.5. In bioreactor cultivations, pH was maintained at 6.1–6.2, and MM1-F medium was modified as previously described . Cell growth was measured by the optical density value at 600 nm (OD600) using a UV–visible spectrophotometer (BioPhotometer Plus; Eppendorf, Hamburg, Germany). The dry cell weight (DCW) was deduced by the previous determination of the correlation between OD600 and DCW values . The H2 concentration in the headspace was measured as previously described . The H2 production rate in the bioreactor experiment was determined as previously described . Cells were disrupted by sonication in 50 mM Tris–HCl buffer (pH 8.0) containing 100 mM NaCl, 19 mM KCl, 5% glycerol and a protease inhibitor cocktail tablet (Roche Applied Science, Madison, USA) and were analyzed by 12% sodium dodecyl sulfate polyacrylamide gel electrophoresis (SDS-PAGE). 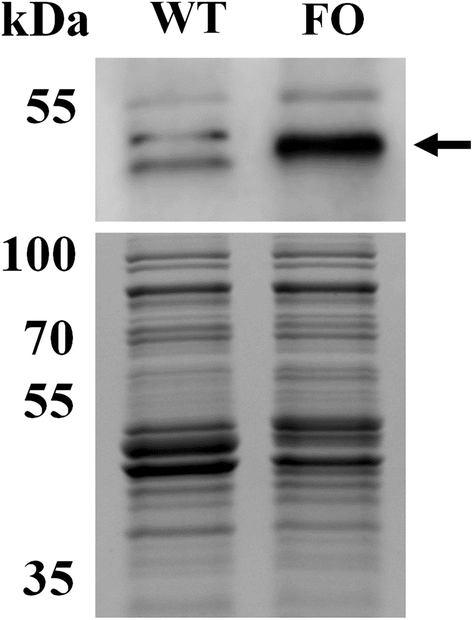 Western blots were performed using primary polyclonal antibodies specific for the frhA-encoding protein or a large subunit of Mfh2 hydrogenase and were analyzed using a chemiluminescent dye with the Immun-Star horseradish peroxidase chemiluminescent kit (Bio-Rad, Hercules, USA). To test O2 sensitivity of cells, atmospheric air (21% O2, v/v) or pure O2 was injected into the headspace of culture vials after inoculation and the optical density of cells grown at 80 °C for 12 h was measured at 600 nm (OD600). To cultivate cells in a bioreactor under oxic condition (presence of O2 in the headspace), reducing agent Na2S was omitted and autoclaving and inert gas purging were not performed. Transcriptomic profiling of the FO strain overexpressing frhAGB was carried out using mRNA samples prepared from two independent cultures. Manufacturing of the microarray slides, microarray processing and signal normalization were performed as previously described . The microarray raw data have been deposited in the National Center for Biotechnology Information Gene Expression Omnibus (NCBI GEO) with the accession code GSE88718. HSL and SGK designed research. SHL and M-SK performed research and analyzed data. SHL, SGK, and HSL wrote the paper with input from the coauthors. All authors read and approved the final manuscript. This work was supported by the KIOST in-house program (PE99722), and the study on operational stability and risk assessment of CO-converting hyperthermophilic archaeon program of the Ministry of Oceans and Fisheries in the Republic of Korea. 13068_2019_1365_MOESM1_ESM.docx Additional file 1: Table S1. Genes identified as up-regulated by overexpression of frhAGB genes based on the transcriptome analysis. Table S2. Genes identified as down-regulated by overexpression of frhAGB genes based on the transcriptome analysis. Figure S1. Construction of the FO strain. Figure S2. Protein level of Mfh2 in the wild-type and FO strains.